“Problems cannot be solved by the same level of thinking that created them,” said Einstein. In these turbulent times, there are plenty of problems to go around. Families, businesses, governments—you name it and issues abound, and it seems like for decades we’ve been stuck. But it may be that these seemingly insurmountable issues facing businesses, society, and government can be solved by tapping into your everyday genius; Reports are suggesting that “creativity” may well be the new form of pragmatism. That’s what Mark Batey proposes in Is Creativity the Number 1 Skill for the 21st Century. Batey, a creativity researcher and editor of the International Journal of Creativity and Problem Solving speaks to “creativity” as being an essential facet of personal skill sets in the future. Big Companies such as Ernst and Young are recognizing the vital importance of creativity for prosperity. In their 2010 report, Connecting Innovation to Profit creativity ranked in as one of the top five insights from leading entrepreneurs in the world. And, there’s even more substantiating the importance of creativity in mainstream society. The latest report on innovation from the revered independent, National Endowment for Science, Technology and the Arts (NESTA) in the United Kingdom emphasized the importance of creativity in tomorrow’s advancements; stressing the importance of psychometric tools, scales and policies to measure, encourage, and advance innovative and creative thinking measures. All this makes creativity an old skill with new found fame. The good news is this: creativity is a talent everyone has, and it can be developed through creative lifestyles, innovative thought patterns, and artistic behaviors. The benefits of adopting a more creative lifestyle are endless. 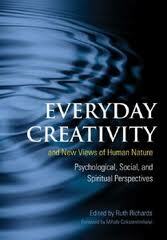 Creativity expert and Saybrook Faculty Member Ruth Richards expounds upon the potential benefits of living a more creative and fulfilled life in her book Everyday creativity and new views of human nature: Psychological, social, and spiritual perspectives. 1) Androgynous: Creativity allows for the bridging of unnecessary and fallacious duplicities, namely: gentle and strong, intuitive and logical. Creativity allows for living beyond stereotypical ways of functioning in the “either or” manner by living in a consistently open and receptive fashion. 2) Observing Actively: Creativity opens up new doors of awareness that allow for conscious mental participation in the daily doings of life. Creativity allows for dialogue with what is being experienced and openness toward new things that will blossom as a result of the active observation. 3) Developing: Creativity breeds an awareness of the interconnectedness of all—and the evolution of personal, societal and species groups. Creativity breeds an understanding of development in all sectors of life including: cultural, biological, spiritual, psychological, and other facets that represent the interrelation and separateness of life. As consciousness evolves, creativity leads to development in ways that represent prosperity, respect and benevolence across all sectors, cultures and species. Creativity has come into its own, changing from an esteemed luxury for artists and elites to a necessary inner attitude and outer perspective for everyone living in today’s world.